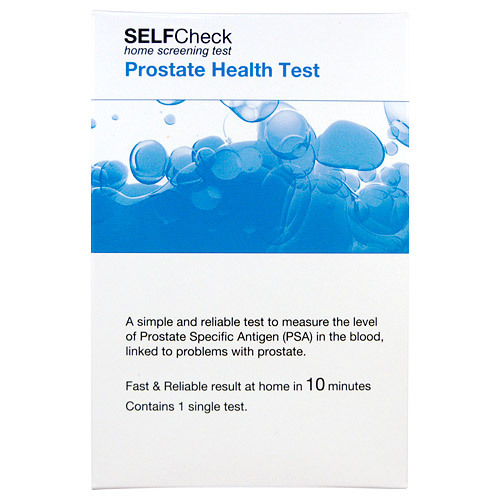 SELFCheck Prostate Health (PSA) Test Kit is a simple and reliable test to measure the level of PSA in the blood. This is a fast and reliable test which will give a result within 10 minutes. Benefits of SELFCheck Prostate Health (PSA) Test Kit? Simple blood test that looks for elevated levels of Prostate Specific Antigen (PSA) in men. Fast & reliable - visual result within 10 minutes. PSA is a substance made by the prostate gland, which naturally leaks into the bloodstream. A raised PSA level can be due to conditions such as enlargement of the prostate gland, prostatitis or urinary infection. It can also be an early indicator of prostate cancer. Each year, around 32,000 men are diagnosed with prostate cancer in the UK. In Ireland, prostate cancer is the leading type of cancer, with 80% diagnosed individuals being over the age of 65 (*source: Cancer Research). Prostate cancer is rare in men below 50 years of age and the average age of diagnosis is 75 years. This test can provide indication of a pre-clinical condition before any symptoms develop. Always consult your doctor for further tests and diagnosis. Do not make any medical decisions without consulting a doctor first. The PSA test is a blood test that measures the level of PSA in your blood. PSA (Prostate Specific Antigen) is a substance made by the prostate gland, which neaturally leaks out into the bloodstream. A raised PSA can be due to conditions such as enlargment of the prostate gland, prostatitis or urinary infection. It can also be an early indication of prostate cancer. The PSA antigen test is the most valuable tool available for the early diagnosis of prostate cancer. However, many men with raised PSA may not have prostate cancer. Why is this test important to me? Each year around 30,000 men are diagnosed with prostate cancer. Prostate cancer is less common in men below the age of 50 years and the average age of diagnosis is over 70. This test can provide indication of a pre-clinical condition before any symptoms develop. PSA level is not raised - No further action. PSA level is slightly raised - Consult your Doctor as you may need further tests. PSA is definitely raised - Your GP will refer you to see a specialist for further tests (biopsy) to find out if prostate cancer is the cause (2 out of 3 men who have a biopsy will not have prostate cancer). Sealed foil pouch with test cassette and desiccant. Buffer solution and instructions for use. Single use lancet and alcohol swab. Test and get results at home, requires only a singer prick blood sample. Please read the enclosed instruction leaflet carefully before performing the test. Keep out of reach of children. Use test only once. Do not use the test after the expiry date. Do not take apart the test cassette. Do not ingest the buffer solution. Store at 15 Celsius to 30 Celsius. For external use only. After use, the test components can be disposed of with normal household waste. There is no danger from any test component, provided you have used all the components according to the instruction leaflet. Consult your doctor if your result is positive and before making any medical decisions. Below are reviews of SELFCheck Prostate Health (PSA) Test Kit - 1 Test by bodykind customers. If you have tried this product we'd love to hear what you think so please leave a review. Arrived promptly and after careful reading of instructions easy to use. Just a bit of hesitation at the point where you use the gadget to prick your finger!! Perhaps someone to help with this part would have saved me 5 mins of hesitation! !